The Plymouth School District welcomes families and other community members to many performances, athletic competitions, and other events throughout the year. Two make-up days were built into the calendar. The last day of school will be June 6, rather than June 4 as previously scheduled. Plymouth High School graduation still is scheduled for June 2. • By week or month: Click "Week" or "Month" as desired near the top. • By school: Click "View by Type" on the right and select the desired school(s), and then click "View." 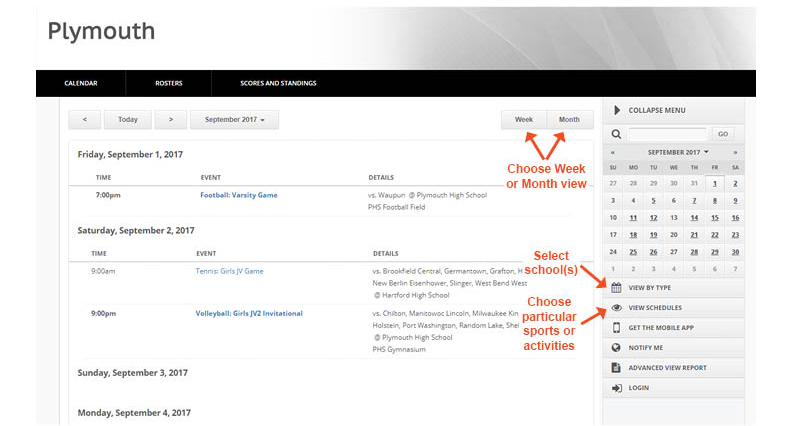 • By sport or activity: Click "View Schedules" on the right and select the desired sports or activities, and then click "View." Those requesting use of school facilities are asked to create an account in Facilities Scheduler. • View or download instructions for creating an account and making a facility request. • Visit the Facility Use page for more information. If you have questions or suggestions, please contact the Community Ed & Rec office at commedrec@plymouth.k12.wi.us or 892-5068.